We had never done a food tour before as a family. 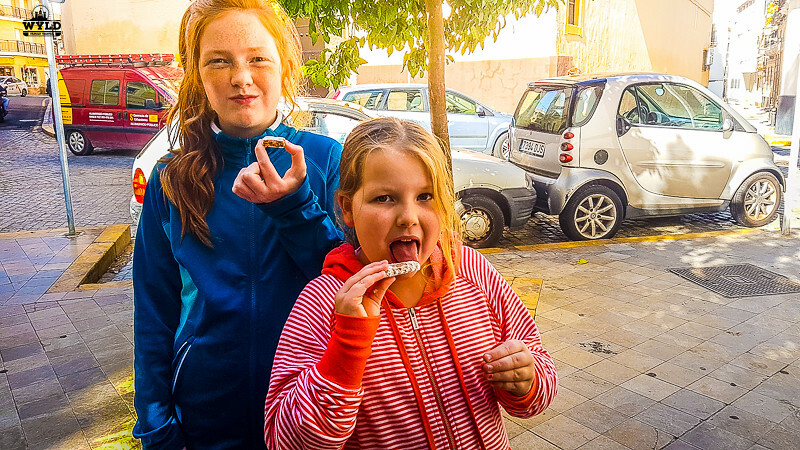 There were concerns on a few levels for us with doing this sort of activity with an 8 and 11-year-old but we had heard the Sevilla Tapas was something we had to try. Would this be a good vacation idea? We had just come to Sevilla from Granada, another amazing tapas town. Sevilla Tapas needed to be on its game after leaving behind the amazing tapas we had had there. You see our 8-year-old is one of the fussiest eaters you will ever come across. So first up the food would be an issue for her. Would she eat Sevilla Tapas or would we be left speechless by her turning down every dish? Secondly the length of the tour at 3.5 hours. Would this turn into a moan and complain session that would drive us and others on the tour mad? Thirdly how would a tour guide used to dealing with adults handle two loud and questioning Australian kids? As we left the apartment Bec and I gave each other that ‘look’, the look that says this could be awesome or a disaster. We met Jamie from Devour Seville under the Seville Mushroom as they call it. Home to the world’s largest wooden piece of modern art. We were booked to go on the ‘Tastes, Tapas and Traditions Food Tour of Seville’ Unexpectedly Jamie was not Spanish. You see Jamie was an Irishman and he had been living in Seville for 3 years. This time in the Andalucia capital had made Jamie very passionate about his adopted home which was more and more evident as we wandered the streets of Seville together. It also quickly made him an immediate favourite of the girls and I they were more than happy telling him their life stories! Phew…this was an amazing start! Where do we stay in Seville? We stayed at apartment Salvador in the Seville Old Town. Beautifully furnished and modern self-contained apartment featuring cooking facilities., shops and The Mercado de la Encarnación are all in close vicinity. The Alcazar and the cathedral are 5 minutes walk away. For more information and booking look HERE. As luck would have it we were the only ones on the Devour Seville Tastes, Tapas, and Traditions tour. Devour Seville is a part of the Devour Spain group that runs food tours across Spain in numerous cities.Jamie was joined by Maria who was in training to be a Guide and we all hit it off as we set off on our adventure. Our minds were at ease…this was going to be amazing! Have you had Sevilla Tapas? Our first stop was a family run cafe just around the corner from our start point called Bodega El Picadero. We had a breakfast speciality of Seville which was a pork stew called Tostá de pringá. The stew comes served on a piece of toast as it is usually made from the leftover pork that is not sold at dinner time. For me, this was one of the best Sevilla Tapas I tasted on the tour, I know it is a big call for the first stop but it was amazing. At this stop Willow, our eldest tried and liked it as well. Our youngest Marley opted for plain toast with jam. Jamie our guide was able to accommodate Marley’s tastes. This was a great start to the tour and a huge weight off our shoulders. Straight away we relaxed, Jamie knew exactly what he was doing. We moved a few hundred meters into the Mercado de la Encarnación to talk all things Jamon. You see the Spanish take their ham seriously, I mean, very seriously. To cut the Jamon is an art form in its self. It usually takes years of practice to cut the ham into perfectly thin slices that the Spanish love. The owner of Corta y Cata spends his day dicing and slicing some of the best Spanish hams available. The slicing is a real craft passed down from generation to generation and we watched in awe as he sliced the ham paper thin with so much ease. We learnt all the different types of pigs and the food they are fed that goes into determining the price and the grade of Jamon. One leg of ham can run into the hundreds of Euros if it comes from the free range pig with black trotters that has fed on acorns for the last month of its life. We tried a plate of Jamón ibérico de ballot (acorn-fed Iberian ham) I liked the ham, the texture was not what we are used to in Australia. It is slightly chewy and the fat from the ham seems to coat your mouth allowing you to keep the flavour for longer. The kids were not too sure of the Spanish ham they tried and were not so convinced that it was for them. There was chatter about colour and the fact it was a bit chewy, unlike the leg ham they so love in Australia. Next, it was time for some cookies, yes cookies as our daughter’s eyes widen with anticipation. You see cookies in Seville are the business of God. Yes, it is said the best cookies in Seville are made in the Convents. In order to fund the Convents, the Nuns have turned their hands from holding the bible to holding a mixing spoon. They make the best cookies in town and this is something we are more than happy to agree with! The Nuns of Convento Madre de Dios de la Piedad make a variety of cookies for you to purchase. We tried the Naranjitos Nuns’ cookies. We watched as Jamie spoke to the Nun about what biscuits would not have nuts in them as we are not certain if Marley has an allergy or not. Neither of the girls could get out of the room quick enough to try them. They were dusted with icing sugar and had a crumbly texture but they were magnificent. Jamie popped the rest in his bag promising the girls he would give them the rest at the end (and he did!) By this stage both the girls were laughing and joking with both Jamie and Maria. They were both working on the girls to try new things and much to our amazement they happily tried some of what was offered! How can other people convince them when we can’t? Seville hop on hop off bus tour. Explore Seville at your own pace with a 24 or 48-hour ticket to the hop-on-hop-off sightseeing bus. Marvel at the mix of Christian and Islamic monuments, such as the Seville Alcazar, enjoy access to some of the city’s attractions without navigating public transport. You cab get your ticket to board the bus HERE, why wait. Holy Week in Seville or Semana Santa de Sevilla as it’s known locally is one of the biggest festivals held annually in Seville. It is celebrated in the week leading up to Easter. Holy week is a festival of possession, floats which depict the events of the passion and the Virgin Mary in life like wooden sculptures. Bar Fresquita pays homage to all things Holy Week. You see the owner loves Holy Week so much he opened a bar so he could celebrate Holy Week every day of the year! The bar has Holy Week playing on the TV and it has pictures of Holy Week on the walls. It’s uniquely Seville and it’s tiny. You would only fit half a dozen people inside which adds to the atmosphere. I bet that if you went more than a couple of times you would be well known. That is something I noticed and really liked…everyone knew Jamie, shook his hand and greeted him like an old friend. The Montaditos with spicy chorizo & Roquefort cheese was amazing. The Spanish are famous for their Chorizo and I was not disappointed by this amazing sandwich washed down with a glass of Tinto de Verano. Sevilla Tapas was starting to live up to its reputation. 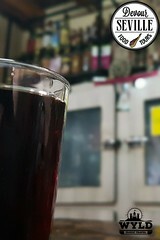 This local drink is very similar to Sangria but is made of one part red wine and one part soda. It is like a light version of sangria but very refreshing. The easiest way of describing a Montadito would be ‘little mini sandwiches’ but if you want a more technical answer, the word Montadito comes from the Spanish verb montar, meaning to mount, so this is a piece of bread with something mounted on top, aka a mini sandwich! On to another of our favourite Seville tastes at La Goleta (The Schooner) La Goleta is a tiny bar in the Santa Cruz area owned by Alvaro Peregil. It’s located close to the famous Granada Cathedral and The Seville Alcazar. This bar’s claim to fame is that it is owned by the son of the late Flamenco singer Pepe Peregil. It could also possibly have the smallest toilet in Spain possibly the world. Until not long ago it was an open urinal in the corner for men just inside the doorway. Now it’s enclosed, with the smallest door possible that rests on the man’s back as he uses the urinal and is still just a urinal for men! Sorry ladies! Originally founded as a wine store by Alvaro’s grandfather in 1904 it still maintains its original features. The bar is popular for selling the amazing Melquiades Saénz aromatised orange wine. It is served in a small shot glass. You don’t shot it though rather you sip it. It didn’t burn like I thought it would but warmed your throat as it went down. The orange wine was a taste sensation that both Bec and I really enjoyed, this one was definitely not for the girls! We loved it so much that we bought a bottle on departure and enjoyed it later on. Stop number 6 was to try some fish, funny enough we had walked past Freiduría La Isla on our first day and I had wanted to stop but Bec didn’t. After trying the fish on this tour I wish we had of, it was amazing. Cazón en Adobo (vinegar & cumin-marinated sand shark) was served old-fashioned style in a paper cone that could be unrolled on the table and shared among all. The fish was lightly coated and really tasty. You could tell this place was good as it was filled with locals of all ages eating fish and their other speciality potato crisps. We sampled the Manzanilla sherry while here. This sherry is made in Andalusia near Cadiz and is generic to this region of Spain. It is a very pale, dry wine and goes great with the seafood we had. Both the girls had some of the fish and the crisps. 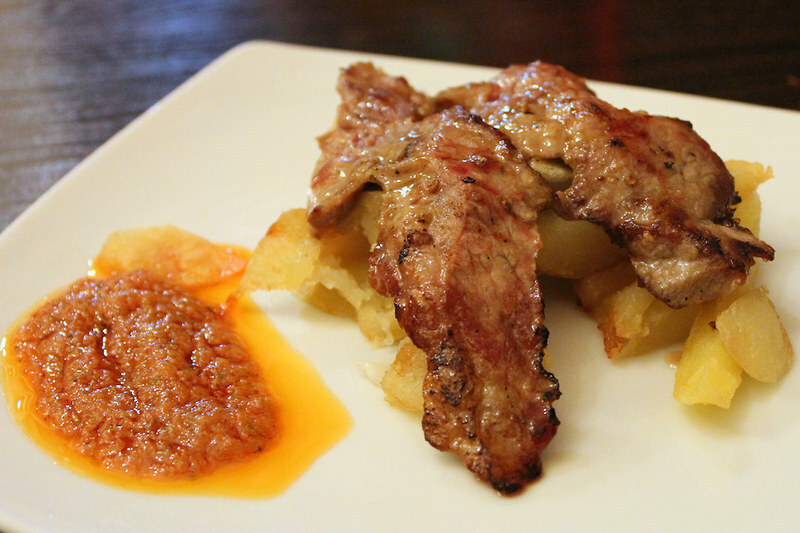 Presa Ibérica which is the pork shoulder served with mojo picón sauce, a spicy sauce from the Canary Islands. La Taberna is tucked away in a back street but once you have tried the Tapas you will know why it’s packed out. The owners live above the restaurant, it’s so small that the cooking is done upstairs in their apartment and sent down by a dummy waiter. We had a selection of Sevilla Tapas to chose from including Brocheta de Mero, Grouper fish with prawns and peppers, huevos con chorizo, fried eggs, chorizo and delicious French fries, Arroz Ibérico, Iberian rice with all the delicious Iberian meats (chorizo, pork loin, jamón) and the Presa Ibérica which is the pork shoulder served with mojo picón sauce, a spicy sauce from the Canary Islands. They are all made by Maria, the owners wife and cook every day. Devour Seville generally book a table since there is limited seating in this place and this place is popular! I tried the huevos con chorizo and really enjoyed it, once again the Spanish chorizo was spot on for me. Willow had the Grouper fish with prawns and Marley had a modified meal of fried eggs and chips! We finished off the tour by heading to La Campana to indulge our sweet tooth. You see La Campana has been serving cakes and coffee to the people of Seville since 1885. The staff still wear waistcoats and serve you your coffee and cake at the standing bar. There are a small number of seats inside and some outside if you need to sit down. 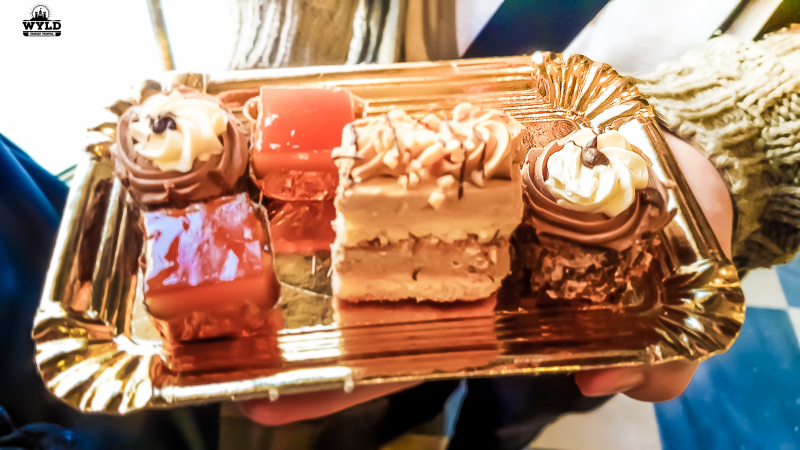 We had a selection of mini cakes to choose from while there and the staff were more than happy to point out the ones that had nuts in them. All the cakes met the approval of the Wyld children. 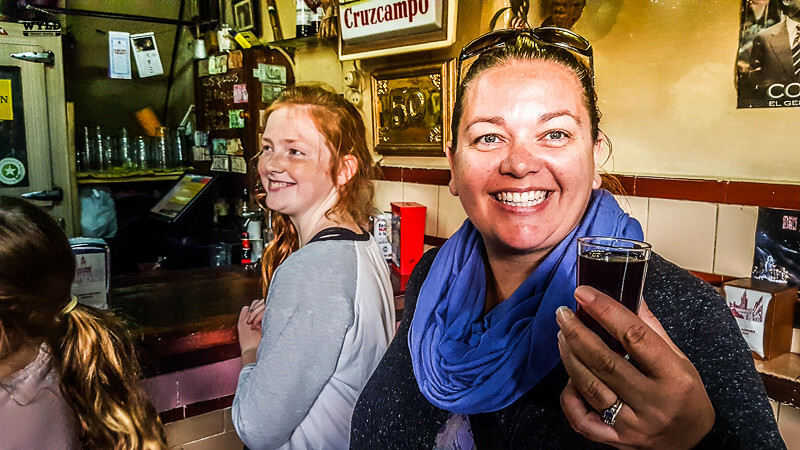 Devour Seville had certainly shown us the best cuisine in the world on the Sevilla Tapas on this 3.5-hour tour. While it sounded like a long time to be on a tour it honestly didn’t feel like that long. We stopped and enjoyed our drinks, meals and tapas at all places not feeling that we were hurried. Both the girls were comfortable in all the places on tour. The girls were greeted just as warmly as Bec and I were. As there were so many stops the distance between them was not far and there are places to sit in most of the spots. Toilets are available in all but one place if you are a woman! If you have any allergies or if you are unsure about a food you are not forced to eat it. Bec doesn’t really like fish but she will have a go at most things when we are on holiday. If you have anything you don’t want just tell Jamie and he will happily make sure there is something you will enjoy. I can’t recommend Devour Seville highly enough. Not only were Bec and I happy but the kids talked about it for days. Marley our fussy 8 year old tried more food on that tour than she has in the last 12 months! So now the question is have you had Sevilla Tapas or when are you booking your Sevilla Tapas Tour with Devour Seville? 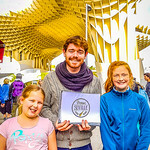 Family Travel Activities in Seville to view and book Now! Wyld Family Travel received a complimentary tour from Devour Seville. This in no way compromises our views and reviews of this tour. 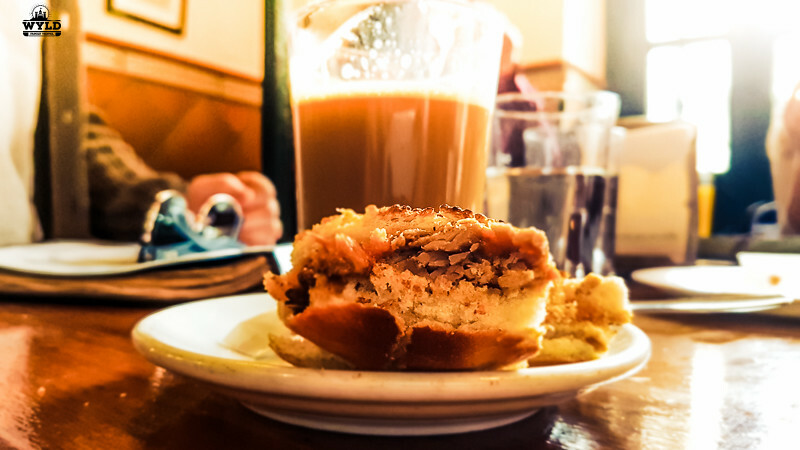 Devour Spain run amazing food tours in Malaga, Madrid, Barcelona and more. Mark Wyld Father, Husband, Travel Planner, Savings Expert, Beer Connoisseur, Photographer, Social Media Tragic, Castle and UNESCO Seeker. Ok, this post made me hungry for some tapas. Spain is such an interesting country, I love how each town seems to have it’s own patron saint and corresponding festival. Had some pretty great tapas in Barcelona, but these look amazing too! Oh Spain, I love it so. I haven’t tried that orange wine it sounds quite good. This is a great guide and explained a lot about the food. 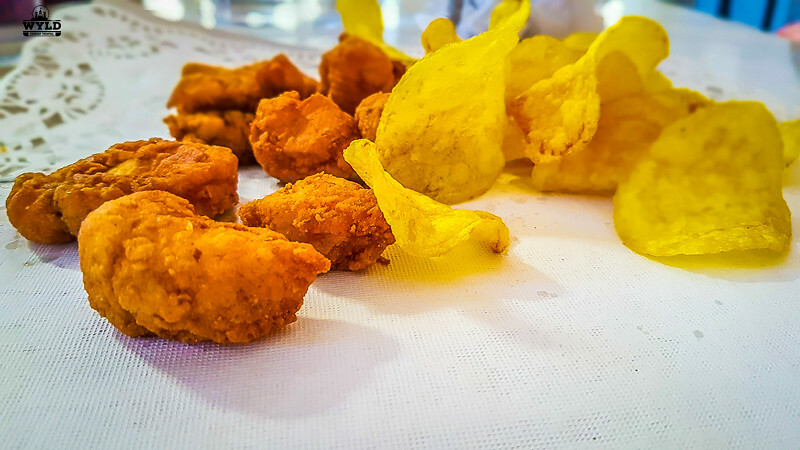 I’ve only been to Barcelona and Ibiza and they have some amazing seafood, but Seville looks like it has some top notch food! Okay I am raring to go back to Spain now. How in the world did I miss trying Tapas? What was I thinking? Gee, I really want to tantalize my taste buds with more local cuisines on my travels now – Noted as a goal for 2017! The tapas look incredible. I’ve had amazing food in three Spanish cities: Barcelona, Madrid, and Valencia, but I’ve never been to Seville. I hope to change that soon. And I’m glad that the food tour could accommodate your daughter who is picky and that the girls tried some new things. Okay the food looks amazing! Even after the meat dominance, I see a lot of tasty options for vegans like us. The taste and culture of Spain has got me high! And a food trip? That is the best thing I have read about! I love taking food tours to get a taste of the city I’m visiting. 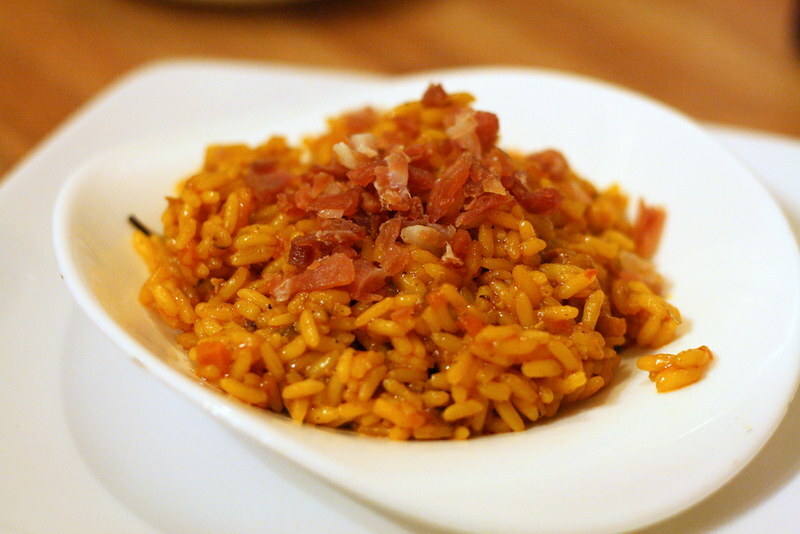 It looks like your taste of Sevilla was quite delicious, especially those fish bites and Iberian rice! Oh how I love anything with chorizo.